Blog Quick Quotes: Xyron and Quick Quotes Day 1! Xyron and Quick Quotes Day 1! Welcome everyone, today is the first day of the partner inspiration and hop between Xyron and Quick Quotes and let me tell you that it is a wonderful combination! I was very excited to create this card because I got to use one of newest collections from Quick Quotes and the colors are simply amazing. The entire collection is called Winter Bliss and, as the name says it, it is a total bliss! For this card I decided to use the Winter Bliss 101 for the base and the Winter Bliss 103 for the next layer. All the papers from this collection will be available very soon in the Quick Quotes Store!!! The size of my card is 4-1/4"x11" with score in 5-1/2". The second layer was created with Winter Bliss 101 and the size is 4"x5-1/4". I pasted this layer directly over the card base. Then I cut a third layer using a Stitched Rectangle Die Cut. For this layer I used the Winter Bliss 103 and I pasted over the card using foam dimensional adhesive. Now, I started the fun part: using the Xyron products in combination with our wonderful papers. Well, to create a great contrast of colors on my card, I decided to use a few scraps of 49 Shades of Gray 102 to cut two different die cuts. The first is the sentiment Merry Christmas and I passed this through the Xyron 1.5 in Sticker Maker. This is perfect for Ribbon, letters, buttons, small paper shapes and small embellishments. I only needed to insert the die cut, pull and tear. Then rub, peel and stick! I also cut a Winter House Scene using the same paper, the 49 Shades of Gray 102. Since this die cut is a little wide, I decided to use the 3 inches Sticker Maker. I have the Non-Refillable option that comes in a beautiful pink color and is very useful with die cuts and embellishments. 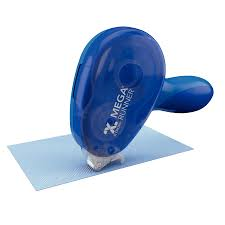 Like the other sticker maker, you only need to insert the element that you want to paste, pull and tear. Then rub, peel and stick! To finalize the card I pasted the die cuts over the turquoise panel and removed the excess of the adhesive using the Adhesive Erase Cube. Winter Bliss 101 and 103 - Coming Soon! Thank you for stopping by and please come back tomorrow to see another amazing project created specially for this blog! See you soon! kim wilson loves to use Xyron on small diecuts and cricut cuts. It is so much easier than applying adhesive. It is also great to keep pieces together for future use on scrapbboking pages. Sometimes I cut it out and don't add it until my oage is finished so it sits there ready for me. Beautiful card, I love the colors. I LOVE my Xyron!!! It makes adhering small and/or intricate items to your project. Sue Kracker here. Beautiful card-love how easy it is to adhere die cuts using Xyron! Such a great card! Xyron makes it so easy! 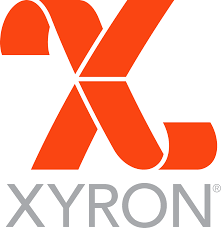 I have used xyron products for a long time. The x is the best for small letters and die cuts. I have every size of Xyron Machine from the very first I think was the 850. Love your card and those wonderful diecuts. Great ways to use your Xyron products.